Why is asphalt parking lot repair so important in Austin, TX? At Bennett Paving Inc., we know that your parking lot is the first impression that potential customers have of your business and if it’s in bad shape you could be inadvertently sending those customers to do business elsewhere. Resurfacing: Although a complete resurfacing isn’t always necessary, it may be if your parking lot is bumpy or damaged. Our experts will give you an honest assessment to see if resurfacing is the best solution for you. Striping: Nothing looks better than a fresh coat of paint! Let our experienced crew make your parking lot look better than ever with new striping. Speed bump repair and cushions: Both cushions and speed bumps can become damaged over time. Our asphalt parking lot repair experts can make them look as good as new in no time at all! Pothole repair: When you think about the wear and tear a parking lot has to endure here in Austin TX, it’s no surprise that potholes form. Vehicle weight combined with weather, water and vehicle fluids take a toll and weaken your parking lot surface. We’ll repair your potholes once and for all. Drainage problems: Water can wreak havoc with asphalt. If you have a problem with adequate drainage – in other words, if there are areas in your parking lot where water accumulates and doesn’t drain off – let our experienced staff repair it to avoid further damage to the asphalt. Crack repair: When it comes to cracks, the longer you wait to fix them, the worse they’ll become. Fortunately, if you don’t wait too long, crack repair usually resolves the problem before further damage is done to the parking lot surface. Skin patching: This procedure may help to repair small areas of asphalt that are cracked or depressed. Ask our experts if this repair technique is the right solution for your parking lot. Seal coat: When it comes to protecting your parking lot, almost nothing works as well as a seal coat. Ask us what’s involved in this process that can work miracles on almost any parking lot. When it comes to repairing your parking lot, nothing counts more than the experience of the contractor doing the job. At Bennett Paving, we understand that you want your parking lot repaired right the first time, and that’s just what we do! We have many years of experience, and it shows in the work we do! We’re so proud to live and work in the Austin area, and we know that you are too! Bennett Paving serves all of Central Texas. You’ll find our satisfied customers throughout Austin and the Hill Country. We understand what Texas weather is like, and how that impacts your asphalt and concrete, so let our experienced paving professionals recommend the best parking lot repair and maintenance for our Texas weather conditions. At Bennett Paving Inc., we understand how important it is that your project is done with the highest amount of quality possible, on time and within your budget. So we’ll do everything we can to make sure we do all three! 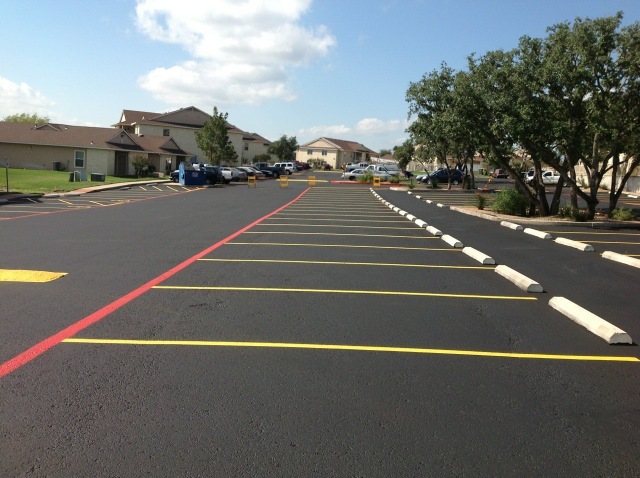 Call us today for a free estimate based on your Austin parking lot repair needs, your budget and your schedule.